Of course, odds say that not every year will be productive or triumphant—after all, at age 28, the site claims he merely “announced the winner of ‘Best Rhythm & Blues Performance by a Female Artist’ at the Grammy Awards.” (For some reason, having his first U.S. No. 1 with “Fame” and the hit Young Americans LP paled in comparison?) And at 32, “he got hit in the face by Lou Reed after a dinner in Hammersmith. 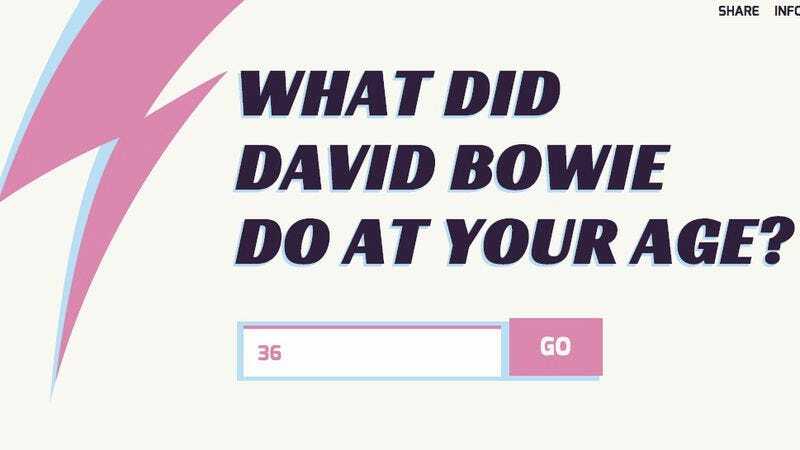 Took it like a champ.” But as a whole, supbowie.com illustrates over and over again that when stacked up next to Bowie’s glories, everyone else’s life achievements pale in comparison.